Committing to write a daily blog requires that one reflect daily. I really like this part of blogging. I appreciate the check-in, the attention I have to pay, the consciousness. I’ve been sitting here, for example, for about an hour with my mind wandering all over the place, thinking about the day, writing a little, dozing by the fire, content as a cat. I’ve written half sentences, half paragraphs, still looking for an opening. Usually, it takes some shape as stream of consciousness morphs into a theme. Sometimes, however, like now, nothing coherent comes. Just random stuff. A lot comes up in this process, though, one way or the other. Thinking about the conversations I had over coffee at two different times today with two different friends.. my takeaway: there is a lot of life going on out there… my hat’s off to everybody. You’re all–we’re all–dealing with a lot-o-sh*t. Life’s good, life’s messy and I’m reminded of a recent expression: Not my circus, not my monkeys. Which is now a thing. But it’s also apt. Not because other people’s lives are none of our business.. there’s plenty of room for empathy, compassion and generosity.. but because there are a LOT of circuses out there with a LOT of monkeys. We are not the only ones on earth livin’ our crazy; there are a LOT of brands of crazy out there, which is to say lots of challenges, lots of alternative happinesses. Many ways to walk through this world. Thinking, for the 58th consecutive year, what the hell Christmas is about… reminding myself that one thing it’s not is the ticking off of items on my ridiculously organized to-do list, though in early December, that’s exactly what it feels like. Maybe that’s okay. Maybe things in life are most enjoyed when you’ve worked hard to get there. Tranquility is most sublime after slogging through the chaos and muck. We all thrive on accomplishment. Accomplishment is one of the essential food groups. And still working on finding the sweet spot in the holidays. Our numerous, numerous little things are adding up to a whole that is its own glowing magic. And yeah, I am deeply grateful for the serenity of our home. For me, peace at home, in part, is a function of order, uncluttered space, and calm. As well, comfort and aesthetics. Respite from the storm. All important. Our home does winter particularly well. Speaking of, weather today was unremarkable, foggy this morning and overcast this afternoon, neither pleasant nor terribly cold. But I, like everyone else in the state, am so relieved at the forecast of an epic storm on the way. I’m ready to hunker down for a couple of days of rain and wind, willing trees not to fall on our roof, as I do. I’m appreciating that Peter gabbed eagerly and forthcomingly at dinner tonight, then voluntarily, without being asked, cleared everyone’s plates from the table…then dropped one on the way to the sink and it shattered, the shock of which made him drop his glass, and milk went everywhere. He laughed out of embarrassment, but he also knew we weren’t going to kill him, which is my favorite part of that story. Very amused by an online program called Elfster that I set up tonight for eight Frame cousins (inlaws and outlaws) that will facilitate the draw for our annual gift exchange. Yet another modern time-saving planning device brought to you by the internet. Not very amused that Jim broke yet another (very prominent) tooth and will have to have yet another implant. Especially after having gone nine months with a very visible gap in his smile. He’s already decided to get fitted for a “flipper” (?) which is a temporary, removable tooth to fill the space, a purely cosmetic device, and in my opinion worth whatever it costs. Poor, poor, poor guy. Hell awaits, including painful shots of novocaine into excruciatingly awkward places. Texted furiously this evening with my cousin, who’s on the front line of elder care, and at the end of a trying, difficult and heartbreaking day with her aging parents. Today’s traumas included a near-tragic miscommunication that left my uncle cold and alone, stranded in his wheelchair on the driveway for about half an hour before somebody noticed, and a tumbling fall on a hard tile floor. Both very unfair, violent and insulting. Hearing that news at 10pm, you don’t get into your car and drive an hour. You don’t call and offer words of encouragement. You just sit with it. And try not to see the picture of either in your mind. Today was a quiet Monday in early December. Life notwithstanding, it was a sweet and gratifying day. I make a point of taking pictures every day so I have something to work from, but sometimes the photo doesn’t tell the right story. 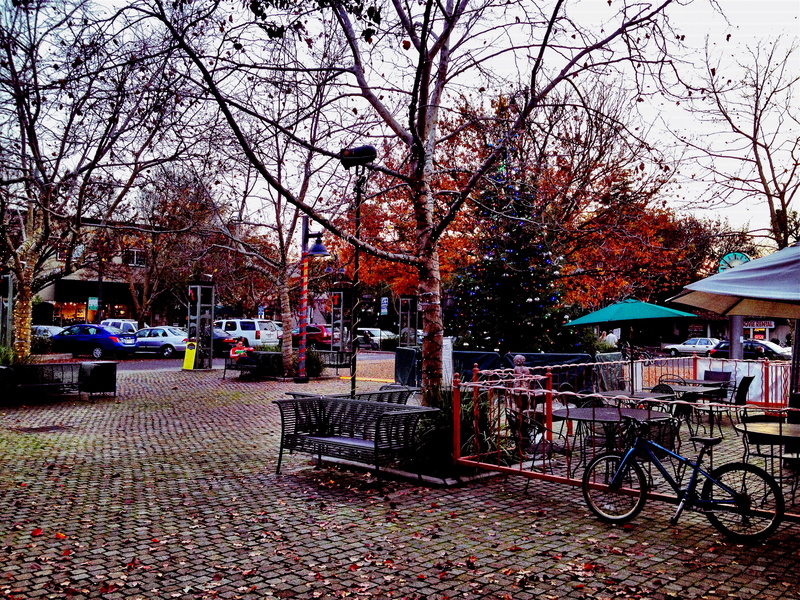 Here’s a downtown shot.. E Street Plaza, including the city’s just installed and decorated tree. I’m the one holding a large bag full of gifts. Finishing, nearly, my Christmas shopping does, definitely, define this day. ** We radar’d many: 71mph, 91mph, 84mph, 88mph. You win if you guessed any of those.